Fourteen of the 21 first-round picks out of college programs in the 2008 draft have now appeared in the major leagues, including Buster Posey (fifth overall), Gordon Beckham (eighth), Brett Wallace (13th), Ike Davis (18th) and Daniel Schlereth (26th). Reese Havens -- taken 22nd overall that year, when the Mets had a pair of first-round picks because of losing Tom Glavine back to the Braves -- might be part of that group with major league experience as well had a persistent rib-cage injury not undermined the past year of his development. But now, after 2010 oblique woes and then offseason surgery to remove an inch of a rib that was causing that area problems, Havens may finally have the issue behind him. He joined Double-A Binghamton on May 27. Scar tissue following the surgery had limited his activities during spring training and during the first month of the season, he suspects. A gifted hitter drafted out of the University of South Carolina, the 24-year-old Havens is hitting .278 with a homer and four RBIs through 36 at-bats with the B-Mets, where his Double-A season ended June 11 of last year because of the oblique woes. Havens is sitting roughly every fourth game with the B-Mets as the organization attempts to ease him back into action without further issue. “They’ve got me on a schedule right now, for the time being,” Havens said. A natural shortstop, the Mets moved Havens to second base a year ago. Given the recent major league issues at that position, Havens undoubtedly would have been prepared for a shot already at the major league level absent the injuries. Havens said he is perfectly comfortable at second base despite injuries limiting his development time. He was working with Tim Teufel at second base with Binghamton last season. Now, Teufel has been promoted to Triple-A Buffalo’s helm, but fellow former second baseman Wally Backman has taken over managing Binghamton. Havens said there is no particular thing he needs to work on. Instead, it’s just about getting repetitions and back in a groove. Average: Pedro Zapata, St. Lucie, .329; Juan Lagares, St. Lucie, .323; Cory Vaughn, Savannah, .317; Matt den Dekker, St. Lucie, .306; Kirk Nieuwenhuis, Buffalo, .301; Josh Satin, Binghamton, .298; Jesus Feliciano, Buffalo, .284; Michael Fisher, Buffalo, .277; Robbie Shields, Savannah, .274; Stefan Welch, St. Lucie, .273. Homers: Brahiam Maldonado, Binghamton, 10; Lucas Duda, Buffalo, 9; Aderlin Rodriguez, Savannah, 9; Josh Satin, Binghamton, 8. RBI: Wilmer Flores, St. Lucie, 36; Josh Satin, Binghamton, 35; Valentino Pascucci, Buffalo, 34; Brahiam Maldonado, Binghamton, 33; Aderlin Rodriguez, Savannah, 33. Steals: Pedro Zapata, St. Lucie, 14; Jordany Valdespin, Binghamton, 11; Cesar Puello, St. Lucie, 11; Matt den Dekker, St. Lucie, 9; Rafael Fernandez, Savannah, 9. ERA: Darin Gorski, St. Lucie, 1.62; Chase Huchingson, Savannah, 2.14; Jeurys Familia, Binghamton, 2.21; Matt Harvey, St. Lucie, 2.44; Chris Schwinden, Buffalo, 3.03; Ryan Fraser, Savannah, 3.25; Greg Peavey, Savannah, 3.27; Gonzalez Germen, Savannah, 3.63; Brad Holt, Binghamton, 3.67; Brandon Moore, Binghamton, 3.78. Wins: Matt Harvey, St. Lucie, 6; Brandon Moore, Binghamton, 5; Greg Peavey, Savannah, 5. Saves: Josh Edgin, Savannah, 12; Jeffrey Kaplan, St. Lucie, 9; John Lujan, Buffalo, 5. Strikeouts: Darin Gorski, St. Lucie, 73; Matt Harvey, St. Lucie, 71; Jeurys Familia, Binghamton, 66; Taylor Whitenton, Savannah, 60; Greg Peavey, Savannah, 58. • Left-hander Steve Matz, the Mets’ top pick in the 2009 draft (second round, 72nd overall), has been backed off throwing because of suspected scar tissue where he had May 18, 2010 Tommy John surgery. Players generally work through scar tissue to break it up, but the Mets proceeded more cautiously with the 20-year-old southpaw, who is a product of Ward Melville High on Long Island. Farm director Adam Wogan said Matz is due to resume throwing Friday, when the extended spring training group returns from a three-day break. Matz, who has yet to throw a professional pitch in a game, will initially be assigned to the Gulf Coast League, not Brooklyn, according to Wogan. That team starts play in Port St. Lucie on June 21. • Full-season Class A teams had their All-Stars representatives announced, and both St. Lucie and Savannah were well-represented with six players apiece. Selected to the June 18 Florida State League All-Star Game at Clearwater, Fla.: right-handers Matt Harvey, Scott Moviel and Jeffrey Kaplan, left-hander Darin Gorski and outfielders Matt den Dekker and Pedro Zapata. Selected to the June 21 South Atlantic League game in Salisbury, Md. : right-handers Taylor Whitenton and Greg Peavey, left-handers Chase Huchingson and Josh Edgin, infielder Robbie Shields and right fielder Cory Vaughn. Sand Gnats manager Ryan Ellis and first base coach Jose Carreno also will participate. • A pair of siblings of Mets farmhands were taken in the draft Tuesday. The Mets selected Binghamton right-hander Erik Turgeon’s brother Casey Turgeon, a high school shortstop from Dunedin, Fla., in the 22nd round. Savannah right-hander Erik Goeddel’s brother Tyler Goeddel was selected by the Rays with the 41st overall pick, which Tampa Bay received as compensation for losing Carl Crawford as a free agent to the Boston Red Sox. He is a high school third baseman from California. The Mets’ Goedell has not pitched in a game since May 23 because of a shoulder strain, but Wogan indicated he should be back for an inning or two soon -- perhaps at a lower level to ease back. • Buffalo’s prospects are on the mend. Lucas Duda, who missed three weeks with a back injury, is hitting .410 with six homers and 13 RBIs in 12 games since a May 28 return while primarily splitting duty between left field and first base. Center fielder Kirk Nieuwenhuis (.301, 6 HR, 14 RBI, .405 OBP), who missed 10 days after landing on his right shoulder making a diving catch, returned Saturday. Third baseman Zach Lutz is poised to rejoin the Bisons after one more Florida State League game on Wednesday night. Lutz originally landed on the disabled list with Buffalo with a hamstring injury after an April 21 game. Then, while inactive and in the dugout, he was struck with a foul ball and broke the ring finger on his non-throwing hand. Lutz’s return to the Bisons will displace hot-hitting Michael Fisher from third base, but not from the lineup, because Fisher has experience at the other infield positions. Fisher, 26, originally was a Braves draft pick, and was signed as a minor league free agent last year. • Left-hander Mike O’Connor returned to action for the Bisons on Sunday, allowing a homer to Brandon Hicks at Gwinnett. O’Connor had made nine relief appearances at the major league level before the demotion. Meanwhile, in his first start with Buffalo after clearing waivers and accepting a Triple-A assignment, Pat Misch allowed six runs in six innings Saturday against the Braves’ top affiliate. Misch pushed himself to 92 pitches, which was a feat since he had not logged more than 31 pitches in any appearance during a two-week stay in the majors. • Binghamton infielder Josh Satin homered twice in Game 2 of Tuesday’s doubleheader against Harrisburg. The performance highlighted Satin’s return from a week-long absence, except for one game at DH, while he dealt with a thigh bruise. Satin is hitting .298 with eight homers and 35 RBIs in 178 at-bats with the B-Mets. A natural second baseman, he has assumed the third-base role since Havens’ arrival. • Oliver Perez, pitching for Double-A Harrisburg, a Washington Nationals affiliate, is due to face Binghamton in a Thursday morning game. Perez is 2-1 with a 1.89 ERA in four Eastern League starts. He has allowed 15 hits, walked three and hit two batters while striking out 14 in 19 innings. • Savannah center fielder Darrell Ceciliani, the 2010 New York-Penn League batting champion with Brooklyn, has a seven-game hitting streak, during which he has lifted his average from .225 to .245. That spurt has coincided with a rare rough stretch for the SAL All-Star Vaughn. He is hitting .227 (10-for-44) with no homers and three RBIs in his past 11 games. • Recent signee Bubba Bell, who began the season with Cleveland’s Triple-A affiliate, was pushed off Buffalo’s roster to Binghamton with the recent return of prospects. Bell has manned center field in his four games with the B-Mets since arriving during the weekend. Carlos Guzman, a Brooklyn native who works out with Jose Reyes and Pedro Beato in Nassau County on Long Island during the offseason, was released. The 25-year-old outfielder was hitting .228 in 123 at-bats with Binghamton. • Chin-lung Hu continues to experience throwing yips with Buffalo. As a result, he is only being placed at second base, and not at shortstop. He also is being pulled late in games. • The Brooklyn Cyclones’ season opens June 17 at Staten Island. Twenty-nine former Cyclones have reached the majors. The most recent: outfielder Ezequiel Carrera, who debuted with the Cleveland Indians on May 20. 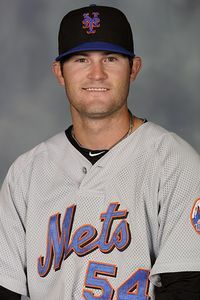 Carrera was one of seven players shipped out by the Mets in the J.J. Putz/Sean Green deal in December 2008. He subsequently was traded by Seattle to the Indians. • Shortstop Wilmer Flores returned to St. Lucie’s lineup on Sunday after missing a couple of days with wrist soreness. The organization’s top position-player prospect is 0-for-his-last 11, and his average has slipped to .255 in 55 games. • Harvey, the 2010 first-round pick from the University of North Carolina, takes the mound again for St. Lucie on Wednesday night. Since getting roughed up for a career-worst eight runs in 3 2/3 innings on May 10, Harvey has limited opponents to four runs while striking out 29 in four starts spanning 22 2/3 innings. • When will a flurry of roster movement occur? Wogan said he never had been a big fan of tying promotions to the midpoints of seasons, after Class A leagues have determined first-half winners. But Wogan said he has now come around to the idea. After all, players get to experience extra incentive and pressure while trying to secure postseason berths for their teams -- even if they will be at a higher level when the playoff games occur in September. As a result, movement among top Mets prospects such as den Dekker and Vaughn may occur in just less than two weeks, after Savannah and St. Lucie complete their first halves. Savannah leads Greenville by 3½ games in that South Atlantic League division, with the Gnats having 11 games remaining in the half. St. Lucie, after a torrid April, is one game over .500 and clinging to a one-game lead over Fort Myers with 12 games to go.